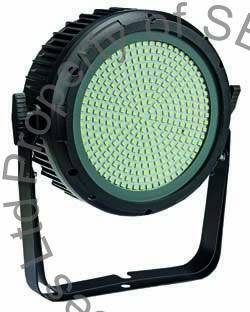 The B Strobe150 is a powerful LED strobe with 330 x 0.5W SMD LEDs offering a replacement for a conventional Xenon strobe. It is unique strobe with a range of special effects. Its 10 independently conrollabel LED segments allow special effects that are perfect for use on stage. Specifically with rental companies in mind, it has a die-cast lightweight housing. the unit comes with preprogrammd stand-alone effects, built in programs with speed adjustments and Master/Slave mode. the B Strobe150 has a refresh rate of +400Hz and is for indoor use. Its clear LED display enables easy menu setting. - DMX mode: 3/10/13 Ch.